This webinar showcases the enhanced BPSim capability in Enterprise Architect 14. We'll step through a sample simulation, and show you how to control simulation parameters, such as execution speed, and review token activity. A convenient, dockable view dedicated to BPSim makes it easier than ever to monitor and log simulation parameters. The cumulative impact of these changes significantly improves your business process analysis! We have provided the example Enterprise Architect mind map model used in the webinar. The EAExample model contains all of the BPSim examples shown throughout the webinar. We are planning to release Enterprise Architect version 14 late in the first quarter of 2018. There will be a beta release prior to the official release of Enterprise Architect 14. Can Enterprise Architect from Sparx Systems be installed on a Linux system? Yes. Many staff at Sparx Systems use Enterprise Architect on Linux Mint on a daily basis. Please review our comprehensive webinar that outlines how to install Enterprise Architect in non-Windows Environments. Please refer to the Installing Enterprise Architect inside Wine or CrossOver FAQ for more information. Can we use random values for variables within a simulation? Yes. A number of different distribution types for parameters are provided to generate random values for a given parameter. On the Distribution tab, you can apply a statistical sampling method to obtain the parameter value; for each type of distribution available, the appropriate fields display for you to enter the parameters of the distribution. All distributions require you to identify the unit of expression. For more information, see the help topic on Using the Parameter Value Dialog. How do you generate random values within a simulation? For example a task will take an average of 10 minutes with a standard deviation of 1 minute. When you add a new Parameter, such as ProcessingTime, simply select the Distribution Tab shown in Figure below. A number of different statistical distributions are available. 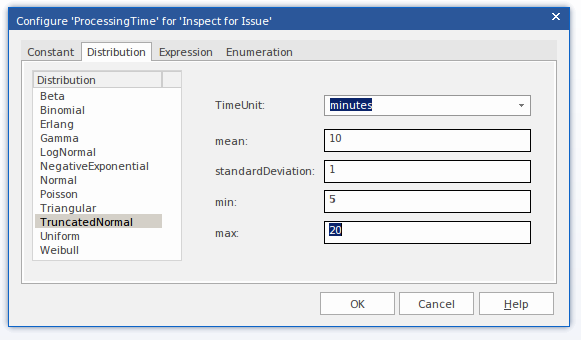 Simply enter the desired values and press OK.
For example, when calculating a task's ProcessingTime, rather than set it for 10 minutes, set it for TruncatedNormalDistribution with the following settings: TimeUnit=”minutes”, mean="10", standardDeviation="1", min="5" and max="20". How do you generate a report from within a simulation? Is a report automatically executed when you Execute a simulation? A report is automatically generated after the execution of a BPSim simulation. Each report is paired with a BPSim configuration artifact. E.g. Artifact1 will generate Artifact1_Report, whereas Artifact2 will generate Artifact2_Report. Where are the example models that were shown throughout the webinar? The BPSim examples can be found in the EA Example Model under the Model Simulation Package, followed by BPSim Models package.